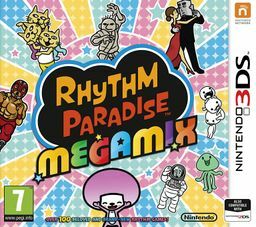 Rhythm Heaven Megamix, also known as Rhythm Paradise Megamix in Europe and Australia, Rhythm Tengoku: The Best+ in Japan, and Rhythm World: The Best+ in South Korea, is a rhythm game released for the Nintendo 3DS in 2015 in Japan, Hong Kong and Taiwan and 2016 in the rest of the world, and the fourth installment of the Rhythm Heaven series. The game largely consists of games taken from past installments, along with handful of new ones. Like previous installments of the series, Rhythm Heaven Megamix is a collaboration between Nintendo SPD1 and Japanese song producer Mitsuo Terada (also known as Tsunku♂). While the WarioWare series and the Rhythm Heaven series have made occasional references to each other in the past (most prevalent in Game & Wario) due to being developed by the same team, Rhythm Heaven Megamix solidifies the link between the two series by including a set of challenges featuring the cast of the WarioWare series. Rhythm Heaven Megamix is a rhythm game tasking the player to play through a series of rhythm-based minigames played using the button, the button, and the . Rhythm Heaven Megamix alternatively offers a tapping control scheme using the , although it does not replicate the more elaborate touch screen motions from Rhythm Heaven for the Nintendo DS. Unlike other rhythm games, Rhythm Heaven Megamix has a stronger emphasis on testing the player’s sense of rhythm and will often subvert the visual cues during the course of the minigames, just like the previous installments in the series. Rhythm Heaven Megamix is composed of 108 minigames: 78 taken from past installments, and 30 brand new. In the early portion of the game, some of the returning minigames have been altered to be easier and feature new graphics and music, while their original forms later appear as sequels. The version of Ringside seen in Wario... Where? 2: The Sequel, with the Reporter dressed as Mona and the Wrestler designed after Wario-Man. Wario... Where? (Made In Course in the Japanese version) is the name of the final two challenge sets in the Challenge Train mode, unlocked after all challenges in Paprika World have been cleared (excluding the "Super Hard" challenges). Each set have the player play through four minigames in succession, with the minigames’ original characters being replaced with those of the WarioWare series. Game 1: Tap Trial with Ashley as the Tap Trial Girl. Red rides Giraffe and provide instructions at the beginning of the game. In order to pass the game, the player must score at least 90 points. Game 2: Munchy Monk with Master Mantis as Munchy Monk. Young Cricket also appears in the background, riding a cloud. In order to pass the game, the player must clear the game with only 3 lives, meaning the player can't miss a hit more than twice. Game 3: Fillbots 2, with Mike playing the role of the titular Fillbots. Dr. Crygor and Penny also appear in the background. In order to pass the game, the player must score at least 90 points. Game 4: Super Samurai Slice with 18-Volt as The Wandering Samurai and 9-Volt riding on his back. Sal Out also appears at the end of the game as the princess. In order to pass the game, the player must clear the game with only 2 lives, meaning the player can't miss a hit more than once. Game 1: The Clappy Trio 2 with Jimmy T. as the third member of the Clappy Trio. In order to pass the game, the player must score at least 90 points. Game 2: Freeze Frame with Dr. Crygor as T.J Snapper as well as Tiny Wario, Dribble, and Spitz as the racers. Mona also appears as a part of the crowd that blocks the player’s view of the background at the end of the minigame, and Orbulon who appears Black Ninja that sometimes appears in the player’s photos. In order to pass the game, the player must clear the game with only 2 lives, meaning the player can't miss a hit more than once. Game 3: Catchy Tune 2 with Kat & Ana replacing Praline & Araline respectively. Mona’s scooter also appears in the background. In order to pass the game, the player must score at least 90 points. Game 4: Ringside with the Reporter dressed as Mona and the Wrestler dressed as Wario-Man. Mona herself appears outside of the Rhythm Arena. In order to pass the game, the player must clear the game with only one live, meaning the player can't miss a hit at all. Masami Yone, the director of Rhythm Heaven Fever, assumed the same role for Rhythm Heaven Megamix. He was assisted by Takumi Hatakeyama, who previously worked as a programmer and designer for WarioWare: D.I.Y. and Rhythm Heaven Fever. Ko Takeuchi returns as the art director, and Yoshio Sakamoto as the general producer. The music is done by Tsunku♂, who also serves as the game's producer. Rhythm Heaven Megamix is the final game developed by Nintendo SPD1. Following its release, the game development arm of Nintendo SPD would be merged into a new division known as Nintendo Entertainment Planning and Development. WarioWare Gold: A plush of Tibby (the protagonist of the game) can be seen during Mona's story segment. Mr. Sparkles' rank A character card states that "Mr. Sparkles goes to a gym known for its celebrities, like that wrestler who gets interviewed all the time. ", referencing the Ringside minigame and its Wrestler character. Dialing the code "CAFE" on the Phone souvenirs will give the player a message where someone explains that putting an Ashley doll in their Cafe lead to an influx of new customers, a reference to how an Ashley doll is placed on a desk of the Rhythm Museum in this game. Direct capture footage of Wario... Where? ↑ Nintendo. (August 5, 2016). Rhythm Paradise Megamix bounces into Australia and New Zealand on October 22. Nintendo Australia. Retrieved August 5, 2016. ↑ Nintendo. (October 13, 2016). Rhythm World: The Best Plus will be released on December 1, 2016. Nintendo of Korea. Retrieved October 14, 2016. This page was last edited on February 10, 2019, at 17:28.